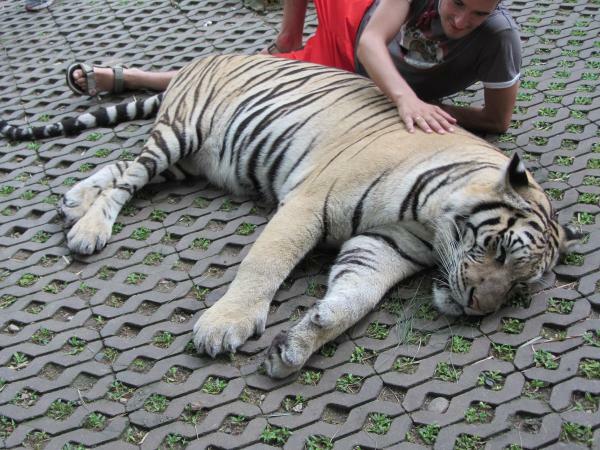 To illustrate the various establishments that exist in the world where visitors can touch tigers, we present a report about the Tiger Temple in Thailand. Since this temple is run by Buddhist monks, many believe this is a harmless activity and an "example" of harmony between animals and people. We would like to remind you, that any form of forced interaction between wild animals and people is stressful for animals and is usually achieved through domestication, using violent methods, sedating and mutilating the animals' claws and teeth to reduce harm in case of attack (more information bellow). The Tiger Temple in Kanchanaburi (Thailand) has become a popular tourist destination that attracts hundreds of daily visitors from around the world. This report is based on information collected between 2005 and 2008..
Tigers are threatened with extinction in the wild, and international trade in tigers is recognized as one of the principal causes behind that threat. Whilst the Tiger Temple claims it received its first tigers legitimately as animals rescued from poachers, CWI has obtained evidence that, rather than continuing as a rescue center, the Temple now operates as a breeding facility and is involved in the clandestine exchange of tigers with a tiger farm in Laos. These actions contravene Thai, Laos and international law (Convention on International Trade in Endangered Species in Wild Fauna and Flora - CITES). CWI has also been in contact with a Thai wildlife trader claims to have sold the first original tigers at the temple. But CWI uncovered that at least seven tigers disappeared from the Temple between 2005 and 2007, and at least five individuals appeared without explanation (one of whom died shortly after his arrival). Most commonly, older animals from the Temple were exchanged for young cubs from Laos. Newly arriving tigers are often given identical names to animals who had been transferred from the Temple to Laos to obscure the fact that tigers are being moved in and out, and to create the illusion of continuity in line with the Temple's claim that it provides its tigers with life-long care. Breeding tigers requires a Government license under the Thai Wild Animals Reservation and Protection Act 1992. The Temple does not have such a license but has, by its own records, bred at least 10 cubs from its original animals. A number of other cubs were born, but did not survive. To be part of a conservation breeding program, the genetic make-up and history of an animal’s parents must be known. But the original animals at the Temple are of unknown origin, nor have they been DNA-tested to identify their sub-species. With this background, the Temple cannot participate in any recognized conservation breeding program. Moreover, there is consensus amongst conservationists that releasing captive-bred tigers is almost never a viable option because of shortage of natural habitat and, in the case of animals that are used to human proximity, such as the tigers at the Temple, release is potentially fatal to tigers, humans and livestock. International zoo guidelines recommend enclosures for tigers of at least 500m2 per pair or for a female and her cubs. This should include a large outdoor space as well as indoor dens. The space should be enriched with a variety of substrates, climbing structures, and water to swim in. The Tiger Temple keeps approximately 15 tigers at any one time. Far from being allowed to roam freely as claimed in the Temple’s brochures, most animals spend almost all their lives in small, barren concrete and iron cages, measuring just 9m x 3.5m (31.5m2) or 12m x 3.1m (37.2m2). Apart from their totally inadequate size, the cages contain virtually no enrichment. Long-term housing facilities at the temple therefore fall woefully short even of minimum requirements. Each day between 1pm and 4pm, an average of ten tigers are put on public display in the Temple's 'Tiger Canyon' which, at the end of 2007, received 300 - 400 primarily foreign visitors a day. In early 2008 however, a volunteer estimated more than 880 visitors in a single day. Aside from touching and sitting on the tigers, being photographed with a tigers' heads in your lap provides a chief attraction for visiting tourists. Tigers remain in the Canyon for about three hours. There is virtually no shade (except for what is provided to tourists) and temperatures can rise well above 40°C in the sun. The tigers are led on a short leash from their cages to the Canyon by Temple staff. There, they are chained on fixed 3m - 5m chains, and heavy concrete bowls are against or set close to the tiger’s body to oblige the animal to adopt a good pose for the tourists and maintain it. Tigers are dragged into position by their tail and even punched or beaten to adopt particular postures that appeal to the tourists. Temple staff stay close to the animals at all times to maintain control by use of tiger urine squirted from a bottle into the animal's face. In the wild, tigers use urine as a territorial or aggressive signal: sprayed at close quarters it would represent an extremely aggressive gesture from a dominant animal. Stereotypic behavior (aimless movements such as head-weaving, chewing, or pacing, repeated many times without change) is common in animals whose natural behavior is thwarted by inadequate, uninteresting accommodation, or by training or control. At the Temple, pacing and chewing paws is regularly and frequently seen both in the cages and during display. This is indicative of stress and frustration imposed by poor housing and improper handling. The CWI investigation raises concerns about the safety of visitors to the Tiger Temple. There are numerous well-documented and sometimes fatal attacks on humans by 'trained' and apparently mild-mannered captive wild cats. These include attacks during photography sessions. At the Temple, hundreds of visitors, some of them young children, are actively encouraged to make close physical contact with tigers during daily photo sessions. Staff fail to prevent direct contact with the animals even when tigers are behaving aggressively. Furthermore, staff and the Temple as a whole, are unprepared and ill-equipped to deal with potential emergencies. The Tiger Temple explicitly renounces any responsibility for injuries or damage, by asking visitors to sign a disclaimer at the entrance. The recommended diet for captive tigers should consist of whole carcasses, including meat, bones, offal and skin. This should be supplemented with minerals and other essential nutrients. Meat should normally be provided raw, to avoid breaking down vital vitamins and other nutrients. A minimum of 3 to 4 kg of meat per day is the recommended requirement to maintain healthy body condition. At the Tiger Temple, the tigers' diet consists largely of chicken carcasses (from which the best meat has been removed for human consumption), with some pork or beef off-cuts, largely of fat, and occasional packets of commercial dog or cat food. The usual ration is no more than 3 kg. All food is cooked (which is necessary because of the risk of avian influenza from chicken). However, with all food having been cooked and only pork or beef off-cuts to supplement the basic chicken diet, the tigers are at risk from malnutrition. Essential minerals, such as calcium and other nutrients, e.g. taurine, are also likely to be missing. Malnutrition can result in blindness, muscle wastage, and skeletal deformity. Some of the Temple’s tigers indeed suffer from poor eyesight and leg deformities. Cubs are removed from their mothers at between two weeks and two months of age (natural weaning occurs at 4 - 6 months) to be hand-reared on human milk formula, which does not contain appropriate nutrients to insure for proper growth in tigers. The tigers are poorly housed and badly maltreated to make them compliant and perform for visitors. Although the Tiger Temple may have begun as a rescue center for tigers, it has become a breeding center to produce and keep tigers solely for the tourists and therefore the Temple's benefit. Illegal international trafficking helps to maintain the Temples’ captive tiger population. There is no possibility of the Temples’ breeding program contributing to the conservation of the species in the wild. The Global Tiger Initiative (GTI), An alliance of governments, international agencies civil society, and the private sector united to save wild tigers, reports the Tiger Temple for breeding and trafficking of tigers. Watch a report on this place here. The center Guilin in China, officially known as Xiongsen Bear and Tiger Mountain Village, is a gruesome tiger and bear breeding farm where 1,500 animals are kept in aberrant conditions, some forced to carry out humiliating tricks during shows. In the tiger museum visitors can buy an expensive tiger bone and bear bile wine, supposedly aphrodisiac. At this link you find an investigation carried out by Animals Asia. To facilitate handling and reduce the risk of interactions between big cats and people, a common practice is to declaw the animals. Far from being an unharmful procedure, it is a brutal and painful process that has broad implications for the animals. Claws are removed by cutting the animal's entire third phalanx of every finger up to the joint; so bones, nerves, joint capsules, ligaments and tendons are also cut off. After surgery, the animals often suffer excruciating pain, damage to the radial nerve and profuse bleeding, bone fragments may remain inside hindering healing or claws can regrow inside of the feet. The loss of this part of the finger changes the conformation of the animals’ feet which can cause damage to the pads and abnormalities in their mobility as they must step on the ground at an unnatural angle, which usually causes back pain. Declawed animals can also suffer chronic pain in the back and joints as the muscles of their shoulders, legs and sword weaken. After losing their claws, these animals have difficulty gripping the meat to eat. Many of the declawed big cats that have been rescued have needed complex surgeries to try to correct some of these problems. To avoid attacks on people, it is also common to sedate animals before any interaction. So it is not so obvious that the animal has been tranquilized, and to pose for photographs with tourists, sometimes they are sprayed water on the face or are provoked with pieces of meat. In places like the infamous Tiger Temple in Thailand, they are sprayed with urine from other dominating tigers in an attempt to keep them submissive.